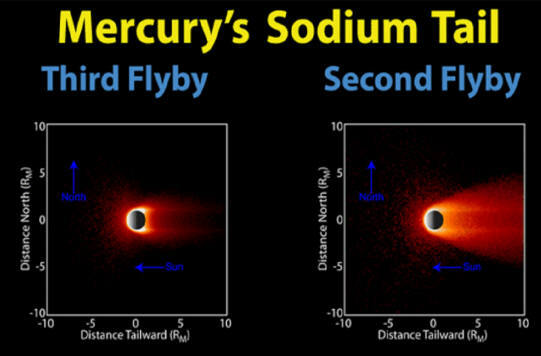 MESSENGER space probe data reveals Mercury's sodium tail varies in size. Mercury's tail represents another "unexpected" result when planetary scientists ignore plasma physics. According to Electric Universe theory, comet tails are created when the cometary plasma sheath accumulates enough electrical potential to discharge, causing it to glow. Irrespective of their individual composition, comets obey the fundamental behavior of charged objects within a plasma shell. Earth's cometary plasma cocoon, otherwise known as the magnetosphere, changes shape and power as electric currents from the Sun impinge upon it. Those electric currents are due to the movement of charged stellar particles streaming out in what conventional science calls a "solar wind." Earth's magnetospheric tail points away from the Sun because of the electrical effect of those high-speed ions. As the Moon revolves through the ionized plasma surrounding Earth, the materials in the lunar regolith gain a negative charge, causing them to repel each other and drift off the surface. As was mentioned in a previous Picture of the Day, charge differential between the day and night sides of the Moon generates an ion “wind” flowing from the negatively charged night side into the more positively charged sunlit side. The electric fields between the two hemispheres can vary by as much as 1000 volts. In a recent press release, the planet Mercury is described as possessing a tail of sodium atoms. This means that Mercury joins Earth and other Solar System bodies that exhibit tails. Venus has a filamentary tail so long that it reaches Earth at times. Neutral sodium has been seen flowing off the Moon. Jupiter's moon Io contributes to a cloud of sodium around Jupiter that extends in a comet-like tail for millions of kilometers. However, as long ago as 2008, astrophysicists at the McDonald Observatory in Texas measured the tail of sodium from Mercury and found it to be over four full Moons long. One of the most interesting aspects about their observations was that the sodium appears to be coming from two high latitude "hot spots." 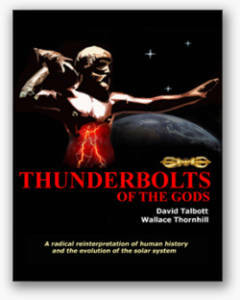 "The most important process missing...is that of electric discharge machining (EDM) of Mercury’s surface. 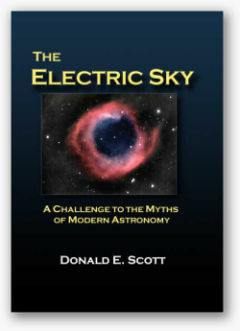 The problem of the astrophysics mind set can be seen in the language used, 'the stream of hot, ionized gas emitted by the Sun' is better understood by plasma physicists as an equatorial solar current sheet rather than a hot wind. Also the exosphere has not existed for the 'age of Mercury' since Mercury has not been in its present orbit for as long as astronomers believe. So we can expect more surprises when MESSENGER goes into orbit about the planet — as usual." Since Mercury has no atmosphere and no magnetic field to shield it from the Sun, terms that have previously been applied to the Moon might help to explain it. If lunar phenomena can be explained by electrical activity, then Mercury's features might also be illuminated by that electrical hypothesis. Jupiter's moon Io might also be a useful model to use for Mercury's hot spots. Io is in close orbit with Jupiter, so intense electromagnetic radiation bombards its surface, removing approximately one ton per second in gases and other materials. Io acts like a generator as it travels through Jupiter’s plasmasphere. More than four hundred thousand volts at three million amperes of current flows into the electric environment of Jupiter from Io. Perhaps Mercury is experiencing something similar as it rapidly revolves around our primary. The hot spots could be where dense plasma foci connect Mercury with the Sun. 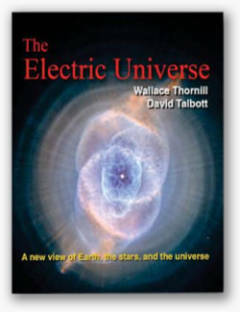 Cathode erosion of Mercury might also provide a reason why its tail seems to be a filamentary structure, reminiscent of Birkeland currents that have been discussed many times in these pages.